Samsung is no stranger to making wearable gadgets. About two years ago, it brought us the Galaxy Gear, which was the company’s first attempt at making a modern smartwatch. 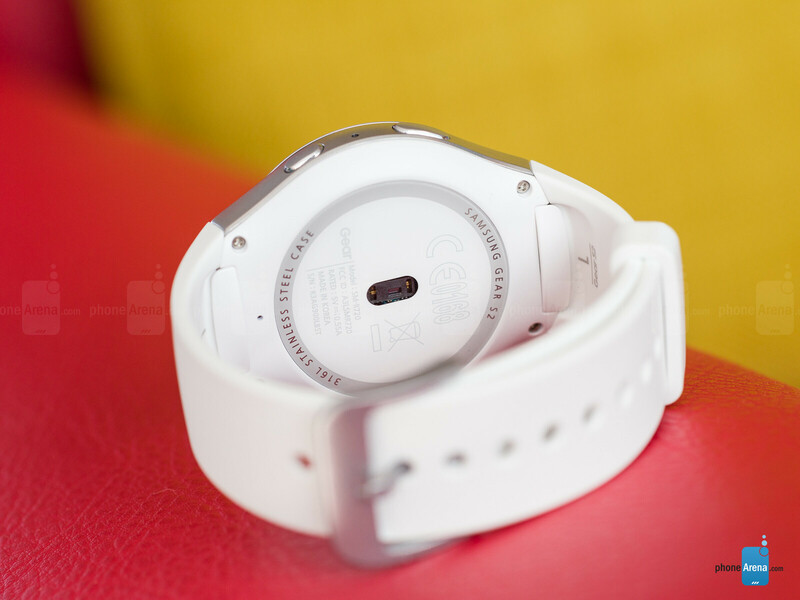 Then came the Gear 2, which filled many of the gaps its predecessor missed, all while adding extras like a camera and a speaker. And for the Gear S, Samsung threw in a larger screen along with a SIM card slot for cellular connectivity. The Samsung Gear S2, however, is shaping up like the first smartwatch by Samsung that holds potential to make a splash on the market -- the first that may appeal to a broad audience of geeks and non-geeks. And we’ve been excited to review it ever since it got announced -- we’ve been looking forward to test-driving its unique rotating bezel and to give its circular user interface a try. All in all, we’re not sure if the Samsung Gear S2 is the best smartwatch ever, but it is most likely the best smartwatch that Samsung has made so far. Is that really the case, and can it justify its $350 starting price? Time to pair it with our Galaxy S6 smartphone and find out! This is what a modern smartwatch for non-geeks should look and feel like. 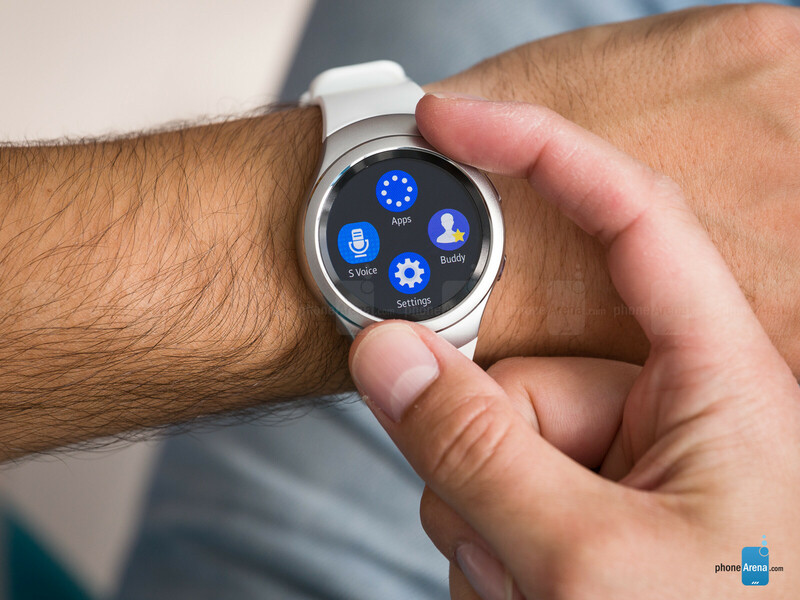 The Gear S2 is pleasant to look at, and the rotating bezel is convenient to use. To say that the Gear S2 is designed well would be an understatement. Both visually and functionally, it is one of the best smartwatches we’ve reviewed so far -- it is a modern, premium timepiece with a minimalist, gender-neutral appearance. It is neither too aggressive, nor too boring, nor too geeky with its looks, and we feel like that’s a recipe for success when it comes to smartwatches. Having that in mind, it comes as no surprise that the Gear S2 draws attention and becomes a conversation topic when noticed by people around us. The casing of the Gear S2 is made of 316L stainless steel, which is a material with excellent corrosion resistance. It has been treated to a matte finish, while the beveled edges of the bezel and the buttons have been polished to a shine. Mind you, the metal is tough, but will get damaged if not treated with care. Bumps against hard, rough surfaces will most likely result in scratches on its surface. It is nice knowing that the bezel has a raised lip, which serves as a bumper protecting the screen. Speaking of the bezel, it is one of the Gear S2’s stand-out features. By rotating it, one can navigate through the smartwatch’s menus, scroll down emails, and interact with apps, having to touch the display only to confirm a selection. The solution is elegant, convenient, and superior to anything similar that we’ve seen on a smartwatch to date, not to mention that you get to scroll down that email without your thumb obscuring the display. Better yet, every rotation of the bezel produces a satisfying click, giving you that pleasant tactile feedback response. 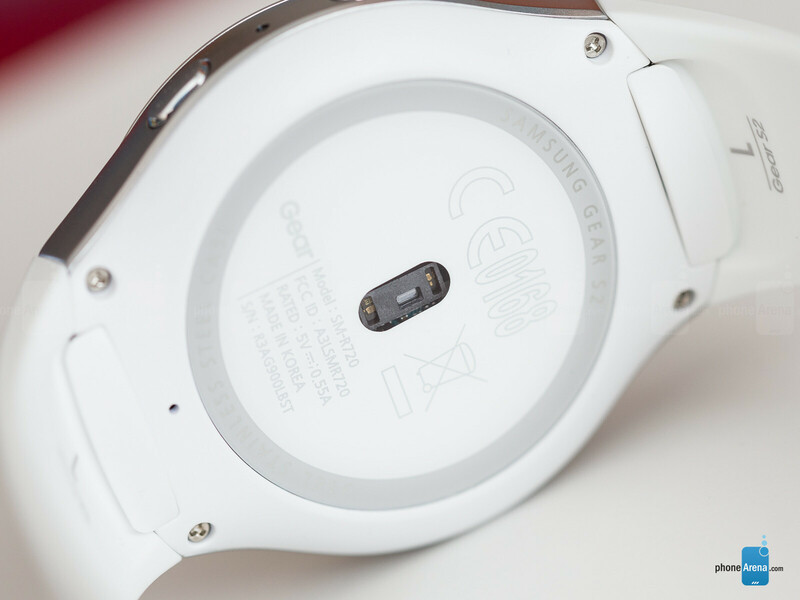 There are two physical buttons found on the Gear S2, both placed on its right side. The upper takes us a step back, and the bottom one takes us “home” by bringing us back to the watch face. A second press of the latter key displays the list of apps. All in all, the buttons work fine, although bit more travel and tactile response would have been welcome. We didn’t use them very often, to be honest. Instead, we mostly used a swipe down gesture on the touchscreen to go a step back. 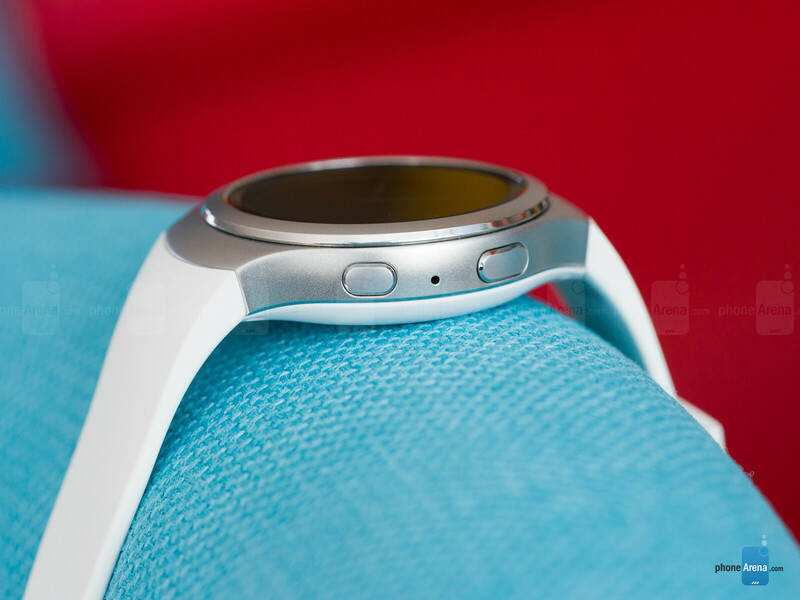 Out of the box, the Samsung Gear S2 is equipped with an L-size wristband. L stands for “large”, as you can probably guess, and it allows the smartwatch to fit on the largest of wrists. Also included is an S-size wristband, which is of length suitable for people with smaller wrists. The material is rubbery, flexible, and soft to the touch. Now would be a good time to mention that the Gear S2 uses proprietary wristbands. In other words, you can’t put a standard, 20-millimeter wristband on the wearable, although you will be able to purchase alternative bands with funky designs from Samsung. 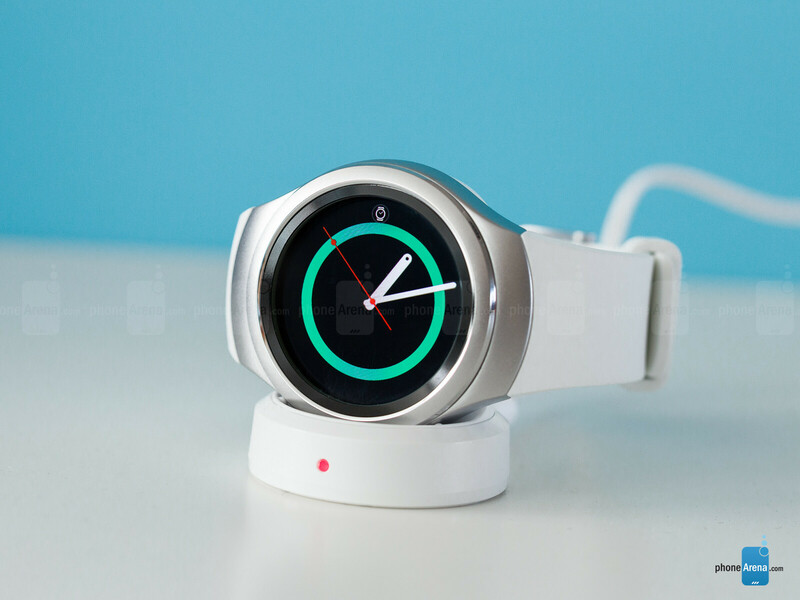 The Samsung Gear S2 is shielded from the elements, carrying an IP68 rating. In plain words, it is resistant to dust and water ingress. You can’t go scuba-diving with it, but you shouldn’t worry about sweat or tap water damaging its internals. A high-resolution AMOLED display produces clear visuals and glows brightly outdoors. But tough luck if its 1.2-inch diameter is too small for you. 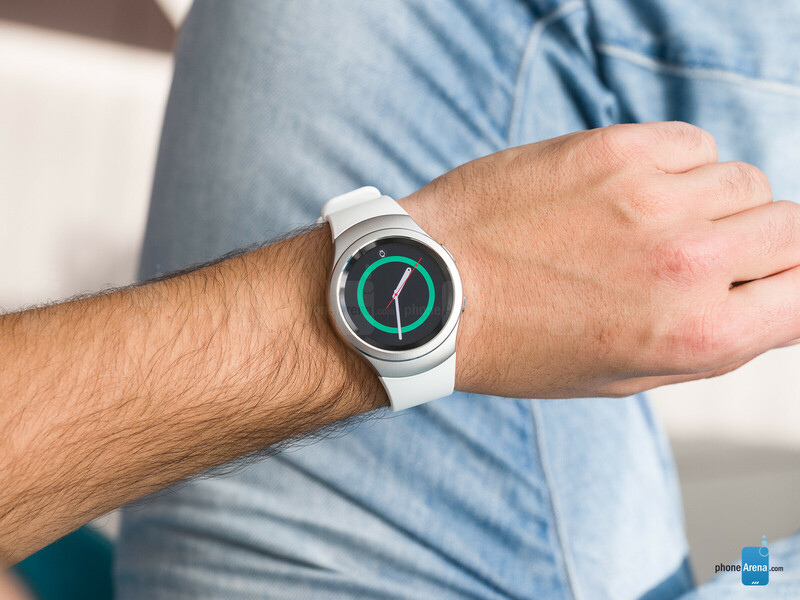 The Samsung Gear S2 sports a Super AMOLED touchscreen display with a round shape. It measures 1.2 inches (30.2 millimeters) in diameter, meaning that it is smaller than the screens of many competitors. The LG Watch Urbane, for example, has a 1.3-inch screen, and the smaller of the two Moto 360 (2015) models has a 1.56-inch one. On one hand, the Gear S2\s display doesn’t feel small by any means and we’re content with its dimensions -- the UI does not feel cramped, and we can operate its touchscreen with relative ease. But on the other, some buttons and UI elements do feel kind of smallish, and we’re sure some folks would have loved having a bit more screen space or the option to choose a bigger model. Size aside, the display on the Gear S2 has a resolution of 360 x 360 pixels, producing 302 ppi for crisp and clear images. Even text of small size is easy to read, not only due to the pixel density of the display, but also because it is usually displayed in white letters against a dark background for optimum contrast. 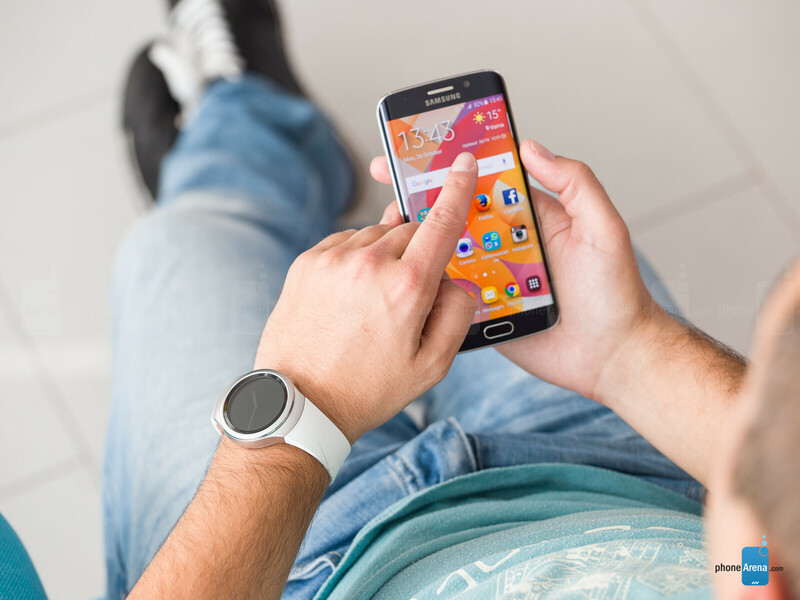 One of the advantages of AMOLED screens over LCD ones revolves around power efficiency. Basically, pixels that display black consume no power. Because of that, you may choose to enable the Gear S2’s always-on display feature without worrying about battery drain. We did and found it to be pretty neat as the time is shown constantly on the screen. On a related note, using a watchface that has a bright, colorful background instead of a black one has a noticeable impact on battery life. As the Gear S2 has an ambient light sensor, it can adjust its brightness depending on the environment. We noticed that its screen automatically gets brighter under bright light to improve visibility. Another effective way of adjusting its brightness is manually, from a pull-down screen or the settings menu. Overall, the Gear S2 is usable outdoors as it glows brightly enough, although we really wish that the glass cover protecting the display was less reflective. A weakness we had to deal with was that the Gear S2’s display becomes less responsive when moist -- during an intense exercise, for example. Sure, you still have the convenient rotating bezel at your disposal, but that is of little use when the touchscreen fails to register your taps or switches between menus on its own. Con 1) Don't all capacitive touch screens? Con 4) Don't all voice commands? I get that these are objectively negative things, but if so virtually every device reviewed over the last 8 years should have these cons too. Looks like a great piece of hardware at any rate. You should know them by now, they will do their best to find something and complain about it, especially if the products is missing the fruit logo on the back. I wouldn't be surprised if one day they criticized an X product for being too premium, or too snappy, etc..., just because they need the feel to nag about everything that isn't designed in California and assembled in China. I'm getting the Gear S2 classic soon. Can't wait. This watch blows the Apple watch out of the water on every review I've seen. It's funny you keep comparing it unfavorably against that ugly, square, tiny phone for your wrist. I bought the base model grey S2, and to be honest its the best smartwatch I've had. Others I've had include Moto360, Sony SW3, LG G Watch, Samsung Gear S. By far the best Pro is the rotating bezel. I'm perplexed...do I want this watch with all of its functionality, or a more simple activity tracker like the Vivoactive or Vivosmart HR? First World Problems. You don't have to use all the other functions, in fact you can turn most of them off. At least this watch doesn't force you to use anything Google. The android wear watches just seem to lag with all the google crap. True. My main concern is the battery life. I currently have the Fenix 3 and although it's not a full blown smartwatch, it has a lot of functionality and the battery lasts me 2 weeks. The Vivoactive lasts around the same time, if not longer so it might be hard to go from 2 weeks battery life to at most 2 days. The price starts at $299, not $350, please correct that mistake. Sign up at Macy's, get 15% off and it starts at $254.15. Awesome deal and it makes it one of the cheaper smartwatches on the market. Tizen is super efficient. 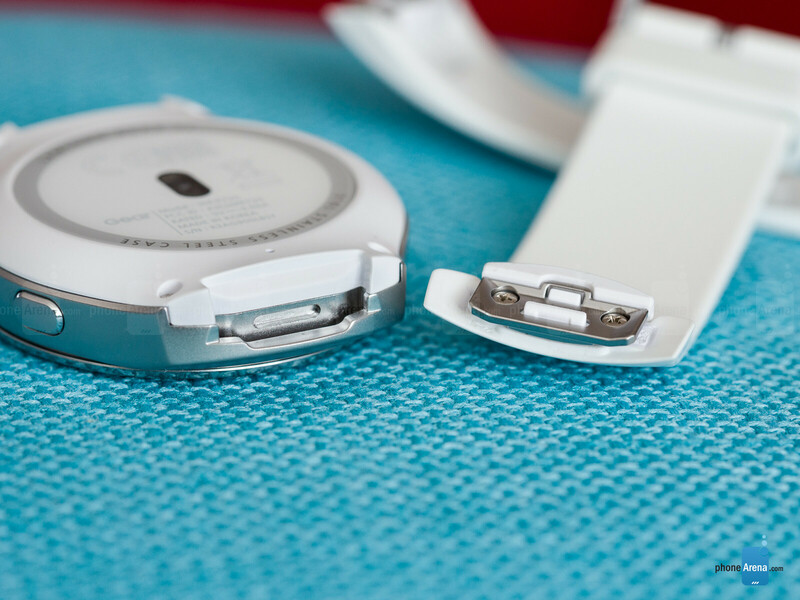 Even with just 250mAh battery, it's able to last longer compared to Android Wear watches with much larger batteries. when set to "always on" and brightness at approx 4/10 (which is PLENTY bright), I go to bed and the phone is typically at around 50%. I'm very pleased with the battery life. I'm confused by a point in this review. I have NOT ffound a way to reply to hangouts messages. it lets me view them, but I have no ability to reply to them. Tizen best os (technically) at least at this point, i wonder why Samsung dont push it enough yet,?! So let me get this straight, you can't control the music on your phone with this watch? You can only store/play music that's already on the watch itself? Ah okay thanks. Didn't get that impression from this review. I just got my classic and it's freaking sharp and I love it. I was going to keep the sport I had for 2 weeks too but super gear manager doesn't allow two watches to be connected at once like Android Wear does. Even though reconnecting to a new Gear doesn't take long/ I rather not disconnect and reconnect when I want to change watches. Samsung needs to fix this. Which one would you recommend? I am really torn between the 2 iterations, since i am yet to see on in person and I can only order it online. The Gear S2 is very sporty looking. The S2 feels wonderful, but I don't think it will go with business casual. I've tried it not, but have yet to see the Classic in person. Can't wait until my Best Buy get's one so I can take a look-see. If I like it near as much as the S2 it's going home with me. And I have not worn a watch in 13 years. I have the Huawei Watch and I intend to keep it even if I ended getting the Gear S2, so I am not worried if the S2 is too sporty compared to the Classic. I am more worried about the feel of the watch, if it feels cheap compared to the Classic, and which one sits better on the wrist. Well, every wrist is different, but when I put it on it felt like it wasn't there. It feels and fits really good. Go by a Best buy, or whatever you have, and try it on. I don't think you could be disappointed. It is on the small side, which is a plus for me, but it feels very premium. If you already have the Huawei watch for dressy situations you should get the sport for casual flip flops situations. The sport version is heavier so it gives it a more premium feeling on the wrist. But the classic fits better overall on my small and flat wrists. If you have bigger wrists, the sport version is bigger lug to lug so I would go with that one. It depends really. The reason I decided on the classic was because I work a lot and I am usually in a dress shirt. They are both excellent though so I would go for whichever fits your lifestyle better. If its mainly dress casual and do a lot of fitness activities, get the sport. If like me and you are always in a suit, get the classic. Thank you all for the help. I guess I'll go with the sport version based on Taters recommendation.